Because claws are inedible, the specimens presented here are not compatible with human consumption. This means that the tool-marked terminal phalanges found at Combe-Grenal, Les Fieux, Pech de l'Azé IV, and Grotta di Fumane were likely used as tools and/or as items of symbolic expression. Although the sample size is small, the fact that all the terminal phalanges that show cutmarks are from eagles argues against their utilization in strictly non-symbolic contexts. This last pattern is noteworthy because eagles are among the rarest birds in the environment, a pattern explained by their high trophic position in the food web . This bias toward large and powerful diurnal raptors possibly indicates that the claws were used in symbolically-oriented contexts by Neanderthals, although the latter contexts remain to be more precisely defined. One possibility is that they were used as ornaments, as has been suggested for the Upper Paleolithic occupations (dated to ca. 20 ka) at Meged Rockshelter in Israel . In Africa and western Eurasia, occurrences of burials and utilized ocher fragments during the late Middle and early Late Pleistocene are often considered evidence for the emergence of symbolically-mediated behavior. Perhaps less controversial for the study of human cognitive evolution are finds of marine shell beads and complex designs on organic and mineral artifacts in early modern human (EMH) assemblages conservatively dated to ≈100–60 kilo-years (ka) ago. 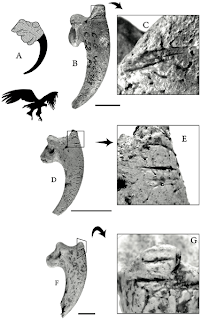 Here we show that, in France, Neanderthals used skeletal parts of large diurnal raptors presumably for symbolic purposes at Combe-Grenal in a layer dated to marine isotope stage (MIS) 5b (≈90 ka) and at Les Fieux in stratigraphic units dated to the early/middle phase of MIS 3 (60–40 ka). The presence of similar objects in other Middle Paleolithic contexts in France and Italy suggest that raptors were used as means of symbolic expression by Neanderthals in these regions. Hmm. I am sure lots of hominids used claws as decorations. Homo erectus in Australia used Tasmanian tiger teeth. But to say the cut marks mean that the eagle claws were used symbolically or non symbolically is a very, very long stretch. The cut marks are precisely what you would expect if you were cutting off the inedible claws from the edible bird legs. There is nothing in the cut marks to suggest the eagle claws were used for any purpose at all. In fact the lack of other markings suggests that they were not used. There are no string holes, no evidence of wear on the cut lines (expected if they were tied to a garment), no wear marks at all. Homo erectus in Australia? Homo erectus never got to Australia, or at least that is extremely controversial. Where do you get that idea of Homo erectus in Australia using Tasmanian tiger teeth, Annie Mouse? We used to play with chicken claws as kids. Pull on a ligament and the dead foot curls, how funny! Of course it must have been very hard to procure eagle claws with intact soft tissues (as opposed to claws of the birds which died and decayed), but the point is, the claws actually have uses other than decorative / symbolic. I think it was the 1984 film "Out of Darkness". I dont have a copy any more so I cant check. There was a hominid skull found in Bega dated about 7 million years ago, but that was pre-Erectus. There is some evidence of Australian occupation 120k years ago (controlled burns, pollen etc). That is earlier than the probable arrival of Homo sapiens. I think that was probably Homo erectus. Homo erectus was definitely in nearby Indonesia and Papua. The Kow swamp folk were certainly very robust (erectus-like) despite their youth. But then Homo erectus had been nearby in Java as recently as 50k BCE. Surely Erectus has to be the number one candidate for the Denisovan folk (who we only know from a tooth). Anyhow here is a link to some similar decorative ornaments showing reasons for beleiving they were decorative.